How is it already December?! Our school year session is already 1/3 of the way completed and we’re starting a busy month of performances today with 12 of our upper-level ballet students performing with Ballet Quad Cities in their Nutcracker today! Dance is truly a performing art, and all of the work we put into classes and rehearsals each week in the studio pays off in great performances on stage. 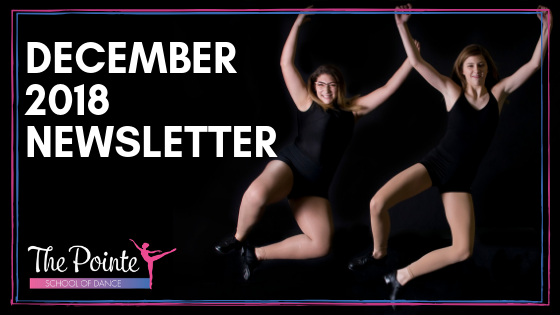 This month, we have several different performance opportunities – including performing with a professional ballet company, at local nursing homes, and our Holiday Show. There is something magical about watching students perform – they build confidence through great performances and seeing their hard work pay off, they learn to think on their feet and problem solve quickly if something needs to happen backstage or onstage to adjust, and the audience gets to be a part of something that happens only once – even when the same choreography is performed again, every performance is a little different. We are so thankful for the opportunity to help guide our students through these experiences, and we hope to see you in the audience of one or more of these December performances! The Pointe School of Dance Holiday Show – Sunday, December 16! Our performing classes are working so hard on perfecting their Holiday Show routines for our performances on December 16! Practice videos are available in your Parent Portal. Tickets for each show are 50% sold out! All tickets are for reserved seats – order yours today to ensure the best spots and to have your group together. Any remaining tickets will be sold at the door for $7. If you have a question about the Holiday Show, please email our office: info@thepointeschool.com – we are here to help! Students in our chapter of the National Honors Society for Dance Arts have organized performances at local nursing homes on Saturday, December 8 and Saturday, December 15. Wear your holiday show costume for an additional performance and bring joy to residents in our community! Sign up to perform here. Students in our chapter of the National Honors Society for Dance Arts will organize fun Parent’s Night Out events throughout the year to raise funds for our nonprofit organization, The Pointe Foundation. Children ages 5-12 are invited to come spend a fun evening at The Pointe learning a dance, making a craft, and having a pizza dinner! See more details and register online here. See dancers from The Pointe perform with Ballet Quad Cities in the Nutcracker! Dancers in our upper-level ballet classes have been invited to perform with Ballet Quad Cities as the Angels in the Nutcracker this year! We are so thrilled to be the dance studio that our local professional company calls when they have opportunities for student performers! We would love to have our studio family come cheer on these dancers who have worked hard in ballet classes for years – and getting to rehearse and perform with a professional company is a very special opportunity! Performances are TODAY, Saturday, December 1, at 2:30 and 7:30 PM. For tickets, contact the Paramount Theatre Ticket Office. 12 Days of Giveaways – Stay Tuned on Facebook and Instagram! Every day, we’ll have a new giveaway that you can easily become eligible for by following a few specific instructions. We have some really fun gifts to give out – check our page every day to be part of the fun! Dancers with excellent attendance progress faster through the levels and perform more confidently throughout the season. We know sometimes illnesses or conflicts come up, and have a generous makeup policy. If your dancer needs to miss their class, we appreciate a heads up (email is best) so our teachers can plan accordingly if they have several dancers out one week for a school concert and dancers are invited to make up any class they miss by simply attending another class at the same level or one level below theirs within two weeks of the absence. There’s no need to ask the office beforehand – just come to the class and let the instructor know you’re there for a makeup 🙂 While it’s ideal to make up a ballet class missed with a ballet class, any genre the dancer participates in will work for make up classes. We will make our decision about morning classes by 8 AM and afternoon/evening classes by 2 PM. If we need to cancel, we will let families know by emailing the entire studio and posting in our private Facebook group (if you haven’t joined yet, please click here to request membership). If we must cancel a class due to weather, we do not schedule additional makeups – we encourage families to attend an alternate class as a makeup. Did you see our Dancers of the Month for November? Read about these awesome dancers here. We’re also doing a fun Senior Feature & Staff Feature each month to help our growing studio learn more about the students who have made The Pointe their home away from home throughout high school and the staff who really makes our studio the special place that it is.